Note: If you need information on WHAT a scene is, I will direct you to these resources: my own very basic breakdown of scenes, this post by my fave author who talks about writing, and this post by another amazingly helpful writing teacher. My headlights go just far enough to cover the next scene that needs writing, and for that scene, I craft detailed plan for what needs to happen. Now, I’ll admit I don’t ALWAYS know what needs to happen in a scene. And when I don’t know is when scenes tend to become Very Short Indeed or else stray into Longwinded Boredom Land. I find that when I actually plan a scene in advance, it usually hits a nice sweet-spot between 6 and 10 pages. Also, I should point out that I totally learned this from Rachel Aaron’s amazingly helpful book 2K to 10K (you’ll notice I loved it so much, I even blurbed it). She has some great, great ideas that literally TRANSFORMED the way I draft. 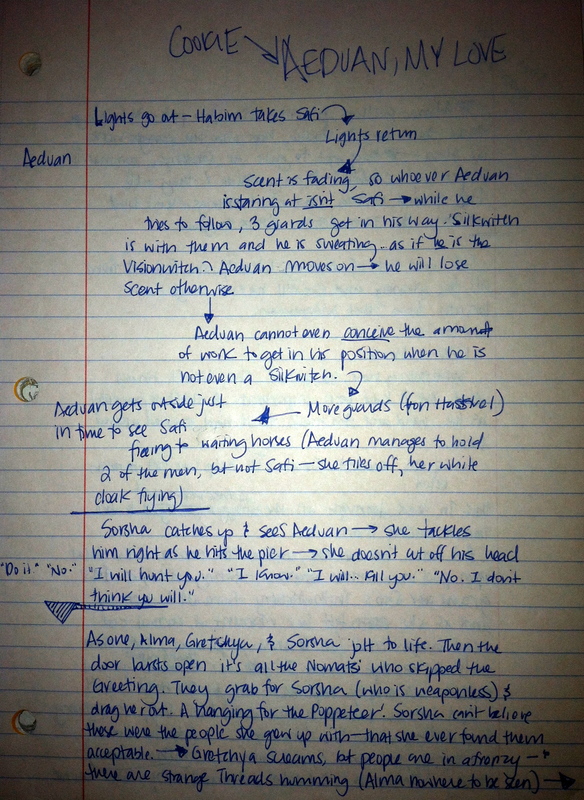 I had always planned a scene roughly before writing (usually by talking it out to my dogs–not even joking), but after reading her book, I planned each scene out by hand. And I learned from 2K to 10K just how important the “magical cookies” really are. The magical cookies or cookie scenes are what I call those sparks in a story that makes you WANT to write. It’s the romantic tension you love and just can’t wait to reach. It’s the high-action fight you’re itching to write or the awesome sneakiness of your villain. It is basically the reason you wanted to write THIS book at THIS moment. But I’m going to let you in on a secret–and this is the KEY to happy drafting (because you’ve GOT to stay happy or you’ll burn out before your career even begins). It’s also the KEY to good writing because when you love what you write, that passion transcends the page. Every scene in your story must be a magical cookie scene. But Susan, you say, there will always be certain scenes that you just have to have.They get my characters from Point A and Point B or else reveal Very Important Information. It’s just the nature of the beast that they won’t be as fun to write, Sooz. Well, to you I say, Wrong! There CAN be a magical cookie in every scene, and I will get into that on Monday. For now, let’s assume you have your cookie for the scene you’re about to write, and let’s circle back to what I do next. As mentioned in the previous post, I’m all about writing in long-hand. 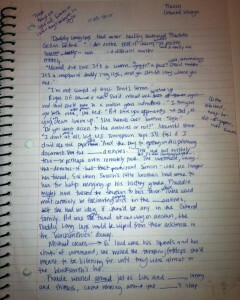 I revise by hand, I outline by hand, and I sometimes draft entire scenes by hand. 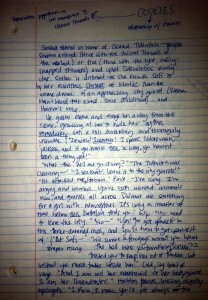 I just find it easier to get my ideas onto the page when I’m writing with a pen, but I realize YOU may not be that way. So there’s no right or wrong way to do this next step (assuming you even want to do it at all). And maybe a note or two on setting. True Story: I did a panel with Anne Greenwood Brown (author of the popular Lies Beneath), and I heard her call her first drafts screenplays. At the time I thought she was craaaazy (sorry, Anne! ), but now I totally get what she was doing. She was outlining exactly as I do, but she just called it her first draft (remember, first drafts can be a form outlining/planning too!). Well, I love that word so much, that I started using it (thanks, Anne!) to describe my pre-drafting outlines. Writing a quick and dirty “screenplay” of your scene before you draft can save SO MUCH TIME. Notice the mention of the magical cookie at the top of the page? If I don’t automatically feel the cookie when I start to outline, I make sure I write it somewhere so I can remember it. I want to constantly feel that spark when I draft! 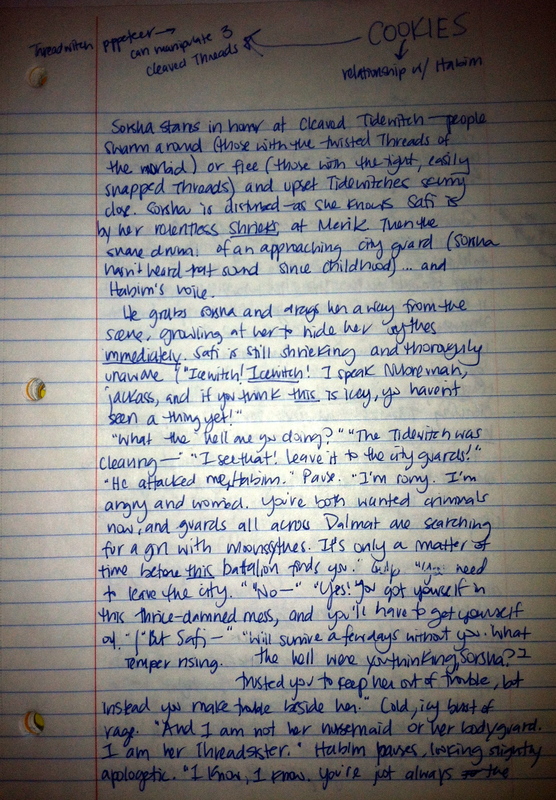 Once I had that screenplay finished, I sat at the computer, kicked off a #BAMFWordBattle on Twitter, and “filled in the blanks.” I typed out all the setting details and emotional beats in addition to the screenplay dialogue snippers/actions I’d already planned. I was able to draft the entire scene in ~1 hour. Huzzah! Now admittedly, it took me about roughly 30 minutes just to make the scene screenplay, BUT–and boy is this a big BUT–1.5 hours for drafting a scene is really fast for me. I used to circle around a single scene for a day and get nowhere. With a 1.5 hour per scene rate, I can knock out 4 or 5 scenes in a day. 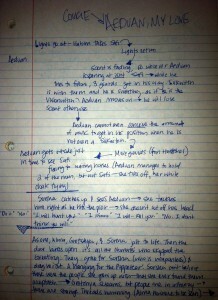 Now here’s an example of a messier screenplay where I had to figure out stuff as I wrote. Ideas would pop up and things had to be reorganized…But I made sure I had everything I needed before I actually sat down at the keyboard. Remember: I’m just filling in the blanks when I draft. The bones are all there, and when I type, I add in the muscle and flesh and blood. Not so organized or clean, huh? 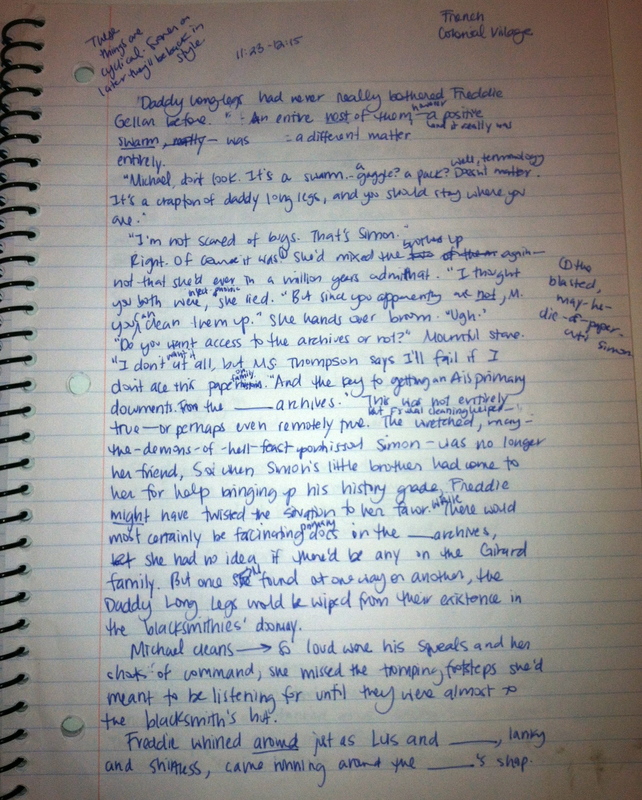 Yet the first draft still came out within ~1 hour. The screenplay might have taken me longer to produce, but at least when I sat at my keyboard, I didn’t waste any time. The magical cookie makes you feel that need deep in your gut to WRITE! And the screenplay helps you stay focused and organized when you actually do write. Also, I highly urge you to read Rachel Aaron’s 2K to 10K or else the blog post version of it here. She does a brilliant job explaining, and as I mentioned, my method really solidified after I read her book. No, I didn’t stark to write 10K in a day (I’ve done that a handful of times…but not regularly), but I did double my daily productivity. And as always, if you have ANY questions, please ask in the comments!